A Prairie Girl's Faith: The Spiritual Legacy of Laura Ingalls Wilder has a unique focus on the faith of Laura Ingalls Wilder, as a person and a writer. 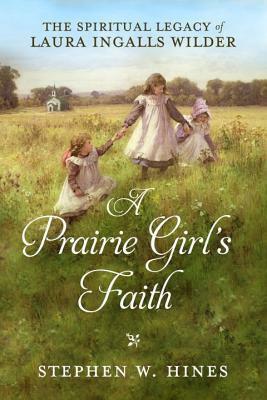 The book also looks at faith as it is presented in the beloved Little House on the Prairie book series. I have been a great fan of the Little House series since childhood, and was intrigued by this book from first mention. It far surpassed my expectations. The writing by Stephen Hines is lively and engaging, with many anecdotes I have not read before -- and specific examples of faith from the books. Topics covered in this book include the Ingalls family, the relationship of Laura and her husband Almanzo, Laura and her daughter Rose, the writing of the Little House books, and more. Stephen Hines posits: "Throughout the eight original titles there are, in the foreground, references to Scripture, hymns, and prayer -- to a daily life that experienced the reality of God" (p. 5). He then gives many detailed and fascinating examples of faith in the books. One example is songs in the books. There are at least 126 songs mentioned in the Little House books, and a number of these are hymns and spirituals. This book looks at music in the Little House books in detail. The Ingalls family originally belonged to a Congregational church, but since that denomination was not as prevalent on the frontier, the family (who moved several times) also actively attended a Methodist congregation. As someone who believes in ecumenical Christianity, I loved this passage: "There was a great spirit of ecumenicism in those days, and the Congregationalists generously shared their building with the Methodists and the Baptists until they could build their own houses of worship. Once they did, Episcopal services were sometimes held at the Baptist church. And when the Catholic church burned down, it received help and the offer of a meeting place from other churches in town" (p. 172). There was a good deal of information about Laura Ingalls Wilder's early writing in The Ruralist and other publications. I found this fascinating, especially as it tied into her development as a writer. The author does discuss the sometimes delicate relationship between Laura and Rose, and their work together. He directly addresses Rose's involvement in the writing process. There is a lovely section about Christmas stories in the Little House books, and the Christmas music featured in these stories. I found the details about Christmas music over the years very interesting. A Prairie Girl's Faith also has a section of The Church Potluck. This section features a number of recipes from friends of the Ingalls family. Anyone who has an interest in food history, as I do, will love this section of the book. "They always had bulldogs after I got acquainted with them . . . Here's a funny little story about the dog. He had a boil on his jaw; and when it went to hurting him so bad, he'd come in and lay his head in her lap and look up as if he was saying, 'Can you do anything for me?' Then she would get some salve and rub it on his jaw. When that was done, he would go back and lay down. Finally, it was healed. Mrs. Wilder - I always called her Mrs. Wilder - didn't even have a dog after he [Almanzo] went away" (p. 177). I highly recommend A Prairie Girl's Faith for anyone who has an interest in Laura Ingalls Wilder's life and work. It is a richly rewarding read. Stephen Hines is a recognized authority on Laura Ingalls Wilder and has authored several best-selling volumes on her life, including Little House in the Ozarks. He grew up in the midwest in an area where Wilder once lived. Hines was the founding Director of Communications for the Tennessee Department of Children’s Services and has held several editorial positions in magazine, newspaper, and book publishing. The author is a contributor to www.littlehouseontheprairie.com. He lives with his wife, Gwen, in Nashville, Tennessee. Would you be willing to post your review of my book at the Amazon site for buying this title? It would be much appreciated. Stephen Hines, the author.